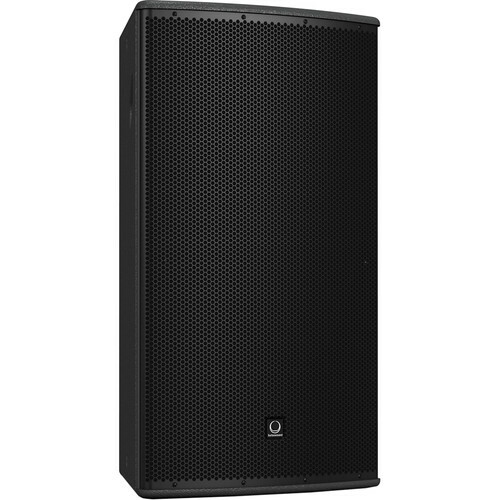 The black TCS152/96-R 15" Two-Way Full-Range Weather-Resistant Loudspeaker with Dendritic Waveguide from Turbosound is a switchable passive / bi-amp two-way full-range loudspeaker, suitable for a wide range of speech and music sound reinforcement applications. It features a carbon fiber-loaded 15" low-frequency driver with inside/outside wound coil for improved transient response. It also features a titanium dome 1.4" neodymium high-frequency compression driver, which is mounted on a rotatable 90° x 60° (H x V) dendritic waveguide featuring multiple hornlets with identical path lengths that provide flat constant-phase wavefront. The trapezoidal cabinet is constructed from 0.59" birch plywood and features a durable weather-resistant semi-matte black paint finish. The cabinet also includes a rugged powder-coated perforated zinc-plated steel mesh grille. The enclosure features multiple rigging points for attaching a bracket mount (available separately), allowing you to suspend the speaker in any orientation. Speaker connectivity is achieved via the captive cable tail with sealed cable gland on the aluminum connector panel. The loudspeaker is designed to work in conjunction with Turbosound loudspeaker management systems, providing optimal FOH performance. It can be arrayed in multiple configurations for extended coverage using fly plates and coupler kits (available separately). The components are IP54-rated weather-resistant, making it suitable for outdoor applications.